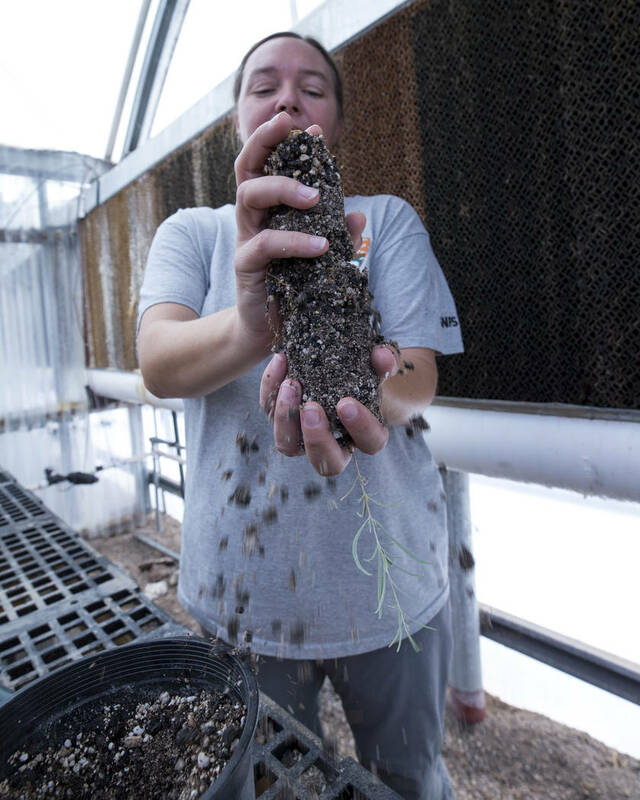 Richard Brian Las Vegas Review-Journal Mojave sage seedlings grow in a greenhouse at Song Dog Native Plant Nursery at Lake Mead National Recreation Area. Richard Brian Las Vegas Review-Journal Biologist Kelly Wallace, manager of Song Dog Native Plant Nursery at Lake Mead National Recreation Area, transplants a four wing saltbush, Saturday as part of the Find Your Roots event that kicked off Latino Conservation Week. The Find Your Roots event they organized Saturday morning helped start Latino Conservation Week. Tapia and Arteaga, who landed their gigs through the Latino Heritage Internship Program, joined four volunteers to clean purple sage seedlings and transplant plants in the park’s nursery. Tapia and Arteaga said their grandparents always recycled and conserved, storing salsa and beans in old sour cream containers and forgoing the dryer to hang laundry out on a clothesline. “It’s still keeping our Mother Earth in mind,” Arteaga said. Find Your Roots began around 8 a.m. with a short hike in the cactus garden, led by Tapia. Tattoos of a compass on her right forearm and mountains on her left biceps stood as emblems of her navigating skills. She showed off some of the plants native to the desert, including the brittlebush. In the summer, its leaves are washed out and gray. But in the spring, the leaves are a vibrant sunset orange. The brittlebrush’s colors lingered with Tapia, but Arteaga remembered creosote’s scent. “It smells like desert rain,” she said. Down the road inside the park lay a cream-colored greenhouse: the Song Dog Native Plant Nursery, named for the coyotes that scatter mesquite seeds around the desert. Saturday’s group gathered outside to hear Kelly Wallace explain the importance of saving native plants. Because a portion of Interstate 11 is being built on part of the park’s land, Wallace and her team salvaged plants that could have been destroyed during construction and kept them to replant later. “We pay attention to the genetics of a particular area,” said Wallace, biologist and nursery manager. She said the nursery manages a collection of at least 200 species of seeds, keeping them in a walk-in refrigerator. “It’s like the Fort Knox of seeds,” Tapia said. In the nursery, four-wing saltbushes that germinated and grew their roots in a cone-shaped container were transplanted into a bigger pot for more room to grow. Turning the container upside down, volunteers grabbed onto the root and placed the plant in new soil. “Ah, it collapsed on me,” said Juan Robledo, a volunteer with Chispa, a League of Conservation Voters subset that caters to Latinos and families and aims to influence policymakers. Robledo found the root and righted the plant. 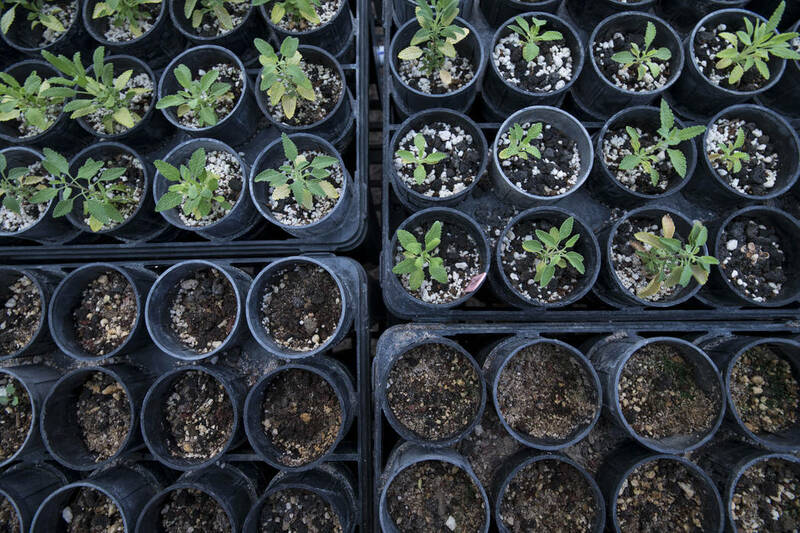 Just as they hope to help the plants grow, organizers from Saturday’s event hope awareness of nature will grow during Latino Conservation Week.